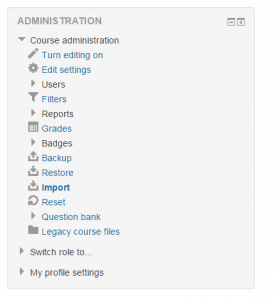 It is very easy to import materials, including course section descriptions and files, from a previous course rather than reloading them. First, go to the course site that you want to import materials to. Under the course settings, make sure that the number of weeks or topics is set to the same value as the pre-existing course. 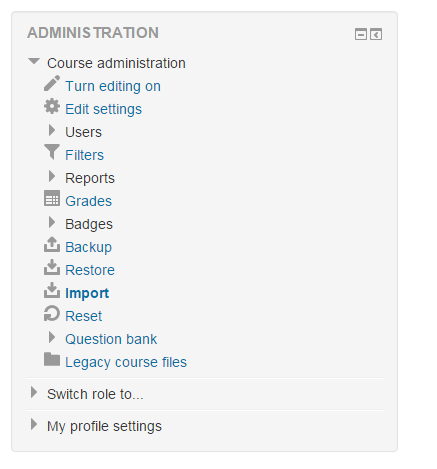 Within the course Administration block, click “Import” as shown on the right. This will then pull up a window listing your courses that are available for importing. You may need to use the search box to find the course you want to import from. Once you have found the desired course, select it by clicking on the radio button at the left. Then click “Continue.” You will then have the option to deselect the materials that you do not want. If you want to copy over all materials, continue to click the “Jump to the final step” button. This will then copy all the selected materials into the current course.